Nitrous oxide ("laughing gas") is a stable, colourless gas used as an inhalation anaesthetic. It is has a slightly sweet smell and taste. Unlike ether, it isn't irritating to the mucous membranes. Unlike chloroform, it is relatively safe, especially if used mixed with oxygen. Hypoxia as a result of high doses of nitrous oxide needed when it's the sole anaesthetic agent may trigger headache, dizziness, hypotension, cardiac arrhythmias, anoxic brain damage, cerebral oedema and long-lasting neural deficits. Chronic exposure to nitrous oxide can cause megaloblastic erythropoiesis, neuron death and damage to the spinal cord. Nitrous oxide is only weakly anaesthetic compared to chloroform and ether. A 50/50 mixture of oxygen and nitrous oxide is used to induce analgesia without loss of consciousness. Nitrous oxide was first synthesised by Joseph Priestley in 1775. Its potential as a surgical anaesthetic avant la lettre was glimpsed by Samuel Latham Mitchill; and later by Humpry Davy before his attention wandered elsewhere. In the modern era, controlled self-administration of nitrous oxide using a demand-valve is common in a hospital setting. Nitrous oxide is used in contemporary obstetrics, for changing painful dressings, as an adjunct post-operative physiotherapy, and in emergency ambulances. 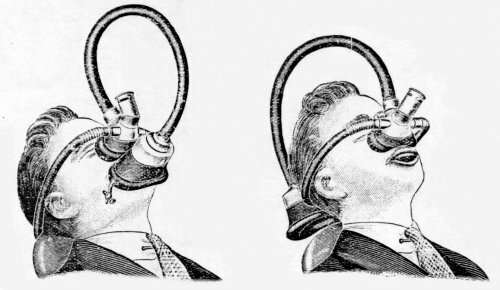 After the abortive demonstration of nitrous oxide anaesthesia in Massachusetts by Horace Wells, Professor Charles Jackson advised William Morton to use ether instead. In the 180s, Gardner Quincy Colton later helped revive the use of nitrous oxide in dentistry. Solubility in water - 1 litre of gas in 1.5 litre of water at 20°C and 2 atm. Specific gravity: 1.529 at 0°C, at atmospheric pressure.